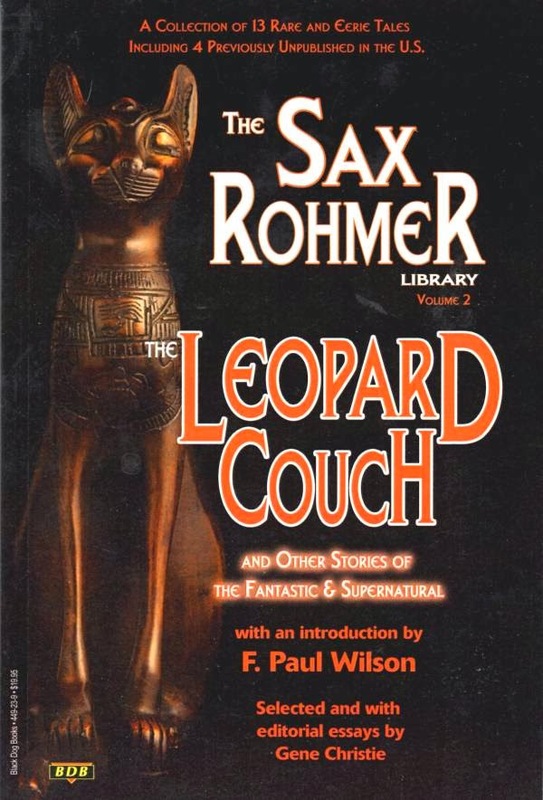 While Sax Rohmer’s fame may have been based on his Fu Manchu books he was also a prolific, and extremely good, writer of tales of horror. The Leopard Couch and Other Stories of the Fantastic and Supernatural includes thirteen examples of his weird fiction, mostly from fairly early in his career. The title story was one of his first published stories, appearing in 1904. Rohmer’s approach was already established. Very little of a concrete nature happens. The supernatural elements are not overt, the author relying instead on atmosphere and suggestion. Does the ancient Egyptian couch, dating from a legendary period before the emergence of the first dynasties, actually have strange and dangerous powers? The experiences of the narrator may be merely the products of an over-active imagination, but then again they may not. A House Possessed is the story of a house haunted not by ghosts but by fire. On no fewer than seven separate occasions people have lost their lives in the house in mysterious fires, fires that for some unexplained reason are always contained to a single room. In the 16th century an occult practitioner, a follower of Nostradamus, had lived in the house. Strange rumours had circulated about his powers. Could these powers still be active three centuries later? Or could the events of the story be merely bizarre coincidences? The Haunted Temple concerns an English archaeologist searching for the magical implements of an Egyptian princess notorious for her sorcery and her membership of a forbidden cult. The archaeologist finds himself becoming more and more fascinated by the beautiful Madame de Medici (a character who will reappear in some of Rohmer’s later stories), a woman who seems to know a very great deal about a princess who died several thousand years ago. Rohmer’s gift for elaborately ornate prose and his ability to create an atmosphere both alluring and overwhelming, almost stifling, are shown to good effect in this tale. Madame de Medici returns in The Red Eye of Vishnu although this time she displays rather different aspects of her character. She is as exotic and alluring as ever but her motives are rather different. The Hand of the White Shiekh is a very effective horror chiller and it is one of several tales in this collection that Rohmer later reworked, in this case under the title The Hand of the Mandarin Quong, with a different setting and slightly different characters. Rohmer altered a number of his earlier stories to give them the touch of the Mysterious Orient which had made the Fu Manchu books so enormously successful. Late in his career Rohmer would have considerable success with his series of novels about the spectacularly beautiful and spectacularly dangerous female diabolical criminal mastermind Sumuru. It’s clear from many of the stories in this volume that femmes fatales had always fascinated Rohmer and he certainly had the ability to create memorable characters of this type. Rohmer never made the mistake of creating villainesses who were merely villains in skirts - Rohmer’s villainesses are dangerous and exotic and they are also very much women. Their femaleness is the source of their power and their danger and is also the driving force of their ambitions. He could create equally intriguing female characters whose power came from virtue rather than evil or who were at the very least morally ambiguous. In fact Rohmer was always more interested in characters who were driven by motivations that seemed to them to be thoroughly reasonable and even virtuous even if they appeared evil to the world at large. That Black Cat, In the Valley of the Sorceress and The Curse of a Thousand Kisses all display Rohmer’s fascination with the power of women, a power that can be frightening but not necessarily purely malevolent. Several of Rohmer’s series characters appear in this volume, including occult detective Moris Klaw (in a very fine tale called The Tragedies in the Greek Room) and private eye Paul Harley. The ancient world figures prominently in this collection, perhaps not surprisingly in view of the immense popularity of Egyptology in the early 20th century. Archaeologist heroes were very much in tune with the spirit of the times. The power of the past projected into the present was one of his major obsessions and it’s a theme he mines relentlessly and very successfully. Purple prose was an accepted feature of popular stories of the weird in Rohmer’s heyday and his prose can get very purple indeed. Personally I love overwrought and highly ornamented prose so that’s no problem at all for me. His ability to pile on the atmosphere of the exotic and the mysterious is another major asset as far as I’m concerned. Florid prose is by no means the only asset of these stories. Rohmer’s plotting is skillful and imaginative and he manages to vary the moods of his stories rather wonderfully. The overheated atmosphere can be menacing or it can be seductive and given Rohmer’s fondness for ambiguous villainesses the reader can never be certain if the heroes are being led to bliss or to their doom. A nicely varied collection of stories by an underrated master of tales of the weird. Highly recommended. Mickey Spillane’s Vengeance Is Mine!